This Nativity is hand-carved in the interior of Nigeria in the tradition of handicrafts that have been produced in this area for centuries. The folk art of this region of Africa specializes in rough hewn wood crafts and textiles. Only in the last couple hundred years has Christian iconography been accepted as an appropriate subject for artisans in the interior of countries like Nigeria. This set includes the Holy Family, a shepherd with two goats, an angel, and three wise men with gifts. The standing figures measure 2.75 inches tall. The stable measures 9.5 inches wide by 6 inches tall. 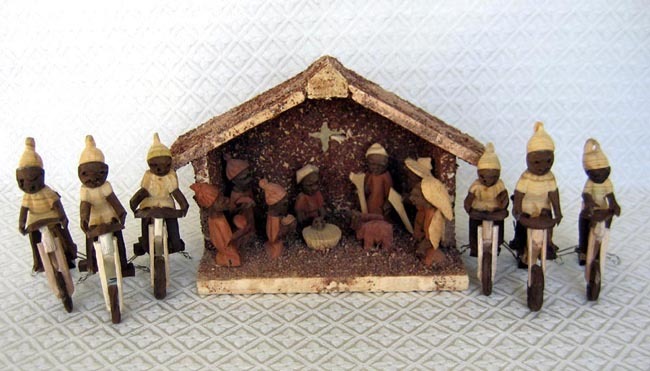 Six villagers have also come to worship baby Jesus on their motorcycles.